In a couple of month's time I will have completed a whole year living and traveling within South America, my one year anniversary will actually be in March. As I look back at how this whole journey started out I can't help but feel proud at how far I have come and how much I have learned along the way. A couple of people have reached out to me to find out how I planned and executed this whole trip so I figured I would write about that and hopefully shed some light on how I prepared myself for my trip. Personally I like planning things in advance to make sure I have everything covered and I am not caught in a situation where I am backed against a wall and I don't know what to do. In life you can't guarantee that all your plans will work out exactly as you expect but I believe it's better to be caught prepared than by surprise. It took me a whole year of planning to make my one year stay in South American a reality. The time frame may sound long or short to some people but as I normally say, "to each their own" personally this was the time frame I felt I needed to get things in order. Once I had made up my mind to undertake this adventure, I made a to do list that actually served as my inspiration while I worked toward making things happen. I had to tie all the loose ends on the home front first before taking off, one of the loose ends included moving out of my rented apartment after completing my lease and selling or donating everything I possibly could so that I didn't have to deal with any baggage. I looked through craigslist for rooms to rent and I was fortunate enough to find a fully furnished basement for rent that had everything I needed so all I had to do was move in with my clothes and a few personal items, this helped me out a lot because when it was time to move out all I had to do was pack up my clothes and leave. The few personal things I couldn't carry with me ended up at a good friend's house for safe keeping. This is what I ended up with when I was leaving. Who wants to deal with health issues while traveling? certainly not me. Fortunately I happen to be healthy but the one concern I had was my eyesight. I had pretty bad eyesight before and I could not survive without glasses or contact lenses. I really didn't want to deal with these things while on the road so I finally decided to go through with surgery to correct my eyesight. The healing process was not fun at all in my case but at the end of it all, it was all worth it! This is a throwback picture of when I got my eye surgery done and finally dumped my glasses. The surgery didn't come cheap and my insurance didn't cover for it but fortunately, through my job I was able to set up a health savings plan which helped out a lot and I was able to financially cover for the surgery. After taking care of my eyes I wanted to be make sure I would be covered for any other issues that would come up during my trip. I did an extensive research for travel insurance plans and decided to go with World Nomads because: they got such good reviews, their rates were very reasonable and I had read that they were very hustle free when it came to handling claims. Good thing I haven't experienced any health issues during my trip but when I had the misfortune of being robbed and lost some personal effects, World Nomads really did a good job of sorting me out and reimbursing me for what I lost so I definitely do give them a big thumbs up. What's a trip without money, right? this was a big chunk of everything actually, if I was to take off for a whole year without any income I needed to make sure my finances were in pretty good shape. I am glad that I had no debt to begin with so this made saving some money pretty easy because all I had to worry about was my day to day living expenses which weren't much. I cut down on any unnecessary expenses and stuck to a budget that ensured I was saving as much of my income as possible. I have to give a shout out to Capital One 360, I really like their online savings account which by the way has really good interest rates. After talking to them about my traveling plans they assured me that I could withdraw money hustle free with my debit card from any ATM worldwide and they wouldn't charge me a foreign transaction fee, this would also apply to any purchases I made with the card. The only thing they couldn't guarantee were the fees charged by whichever foreign bank I had to withdraw money from because this was out of their control so I would have to pay any local applicable fees. I can tell you so far I have not had any issues with my card and I access my money through ATM withdrawals using my debit card. Since my account restricts me to 6 such transactions per month, I try to budget for my expenses in advance so I can withdraw enough to cover me and not have to make frequent trips to the ATM. I also made sure to put a travel notice with all the financial institutions I deal with to make sure access to my money isn't blocked while abroad. I knew which countries I was interested in checking out so this made planning easier as I knew how I was going to move from one country to the next based on their location. Colombia was the first country in South America that I was going to start off with before moving down to the other countries that I was interested in. 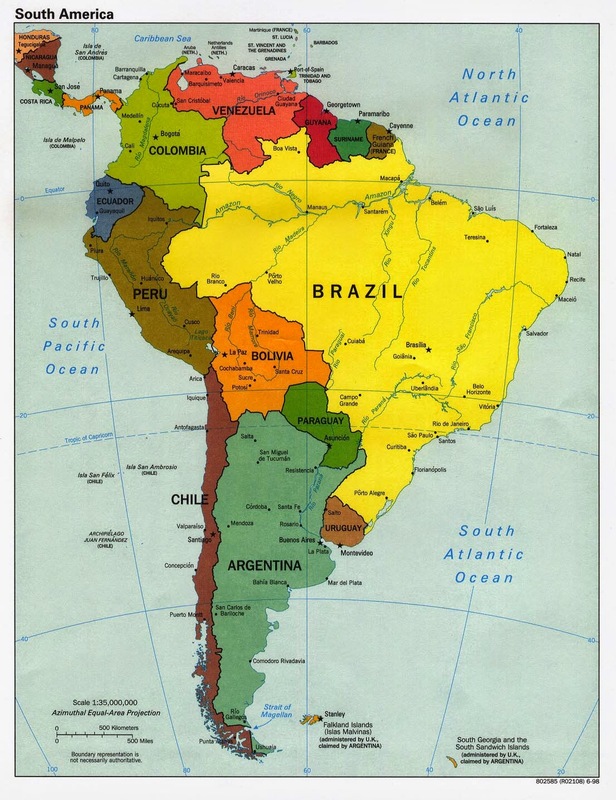 I constantly referred to the map of South America to help with my planning on border crossings and such. I also made sure to know the visa requirements of each country before leaving so that I wouldn't find myself on the wrong side of immigration. I really wanted to live with the locals in each country I visited so I could experience the different cultures and learn Spanish. I was lucky that one of my friend's had a connection in Colombia so I ended up being roommates with his friend in Colombia which really helped me adjust to my surroundings pretty quick because it felt like I was part of a family and I had someone always looking out for me. In Ecuador and Peru I used airbnb to find rooms for rent in local homes and I was fortunate to find good hosts in both countries. In Ecuador I stayed longer than planned just because the family I was renting a room from was so amazing and they took me in as one of their own. Ecuador is a small country so I found it convenient to make Quito my base then explore the other cities over the weekends as opposed to moving from city to city. That's it folks, I think I have covered quite a bit and I hope the information provided answers some of the questions I have received about my trip.